What a gorgeous week it’s been in the forest! The children have been sharing their interests and requests with us this week and it’s been really clear upon reflection that there has been a very strong interest in building fires. We observed some children engaging in fire building role play so suggested we could go off-site to collect sticks to build a real fire. The children were really great at identifying which sticks would be good for the fire, and which ones were the right length and size for toasting marshmallows (the most important part!). Back at our fire circle we discussed fire safety and allowed the children to share their own knowledge about what fires need. Two suggestions were “sticks” and “oxygen”- how clever your children are! This interest continued as the week progressed with more requests for fire building and the introduction of some basic tools to support children in whittling their own sticks for marshmallow toasting. 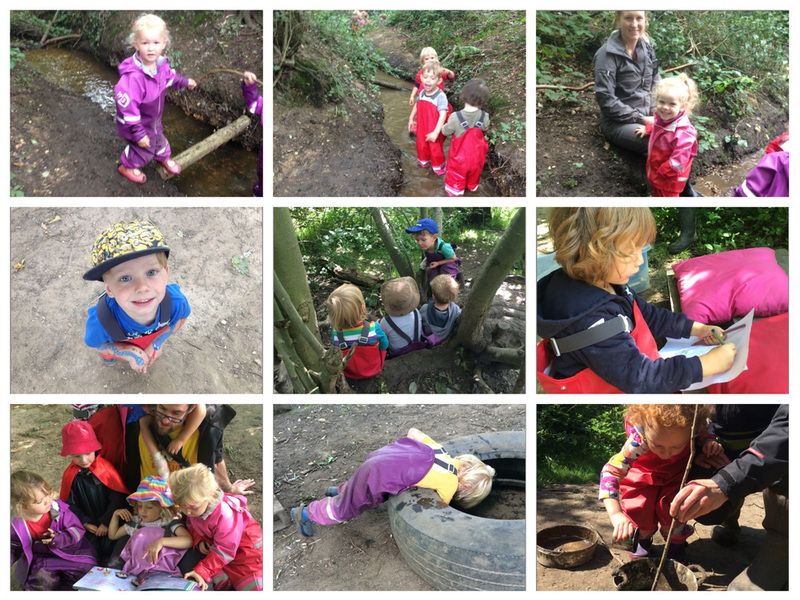 We saw fantastic levels of understanding and physical development skills, which reminded us just how much the children love to take part in completing ‘real-life’ jobs. Another interest this week has been in some animals we have found on site. Once again the children have been so loving and nurturing with snails (informing their friends that the snails will come out of their shells "because they trust me to be gentle”) and caterpillars. We also seem to have a very confident rabbit visiting the fire circle regularly, some children have sat and watched in awe as the rabbit hops around the middle of the circle munching on the greenery. As if all that wasn’t enough a small group of children found what we thought was an injured bird yesterday. The children were able to get really close and some were even able to stroke its feathers very gently. After finding ‘food’ for the bird and talking about what we could do to help it the bird suddenly hopped up and flew away. The children are certain their care helped the bird to feel better, hence its speedy recovery! We would like to take the opportunity to remind you that we will begin our reflective sessions at the Scout Hall next Monday. We will be spending time with the children after dinner to reflect upon the day by sharing treasures we'll collect in the forest, looking at photographs of the day and having lovely conversations about our time in the forest. In order for this to be successful we ask that you please wait in the foyer area so that children are not distracted by lots of people coming in and out of the room. A member of staff will be available to talk to you and another member of staff will discreetly collect your child from the group. As this will all be very new to the children we expect that it might take some time for them to become used to the idea but we are certain that once they do this time will be really beneficial to all. We ask for your patience as we continue to support the children with this. According to the weather forecast next week is also going to be a warm one! Please remember to pack a sunhat in your child’s bag and apply their first layer of sun cream before drop off. Our lost property box has now swelled to three boxes full! As a reminder, the lost property boxes are available in the foyer of the scout hall Monday to Friday from 4pm-6pm if you are missing any items you'd like to try and track down!